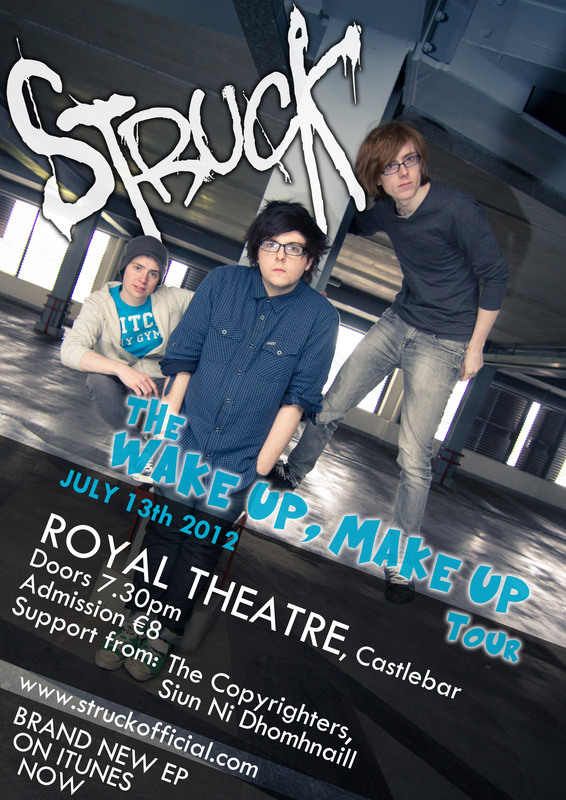 Castlebar - County Mayo - Struck to play hometown show in The Royal Theatre! Castlebar pop punkers Struck are to play a special hometown show in The Royal Theatre as part of their "Wake Up, Make Up" Ireland Tour. After releasing their brand new EP "Wake Up, Make Up" last week via iTunes, Struck have taken online & traditional media by storm. From being publicised in national newspaper The Irish Daily Star and local papers, from being the second most talked about topic in Ireland on Twitter, to getting airplay on iRadio and Today FM, the lads really have exploded onto the scene in the last week. You can catch them in The Royal Theatre on Friday 13th July at 7.30pm. Admission is €8 on the door. Support will come from locals: The Copyrighters and Siun Ni Dhomhnaill. You can buy Struck's brand new EP from iTunes.